Welcome to the November 9, 2018 edition of ACM TechNews, providing timely information for IT professionals three times a week. Tokyo, Japan-based Signpost Corp. has developed a system that could rival Amazon Go in terms of quickly providing consumers with products. The Super Wonder Register system uses cameras and artificial intelligence software to track merchandise purchases, without the need for clerks or cash registers. 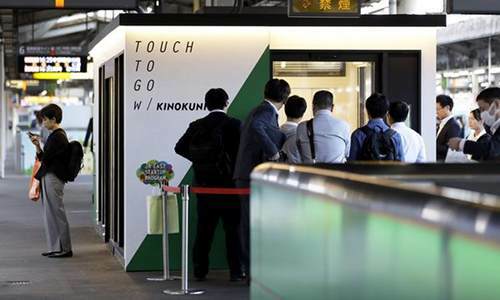 The system, which Signpost founder Yasushi Kambara said can be installed in any store, has already been deployed in a kiosk on the platform of a train station in Tokyo. Kambara said Signpost plans to install 30,000 systems in Japan by February 2021, including the Wonder Register, a simpler checkout terminal that identifies products using cameras. Said Kambara, "There are already automated highway tolls and turnstiles at train stations. In the same way, we want to automate store registers. That's my dream." An international research team developed a tool that could help security analysts and machine learning developers build trustworthy deep learning models by correctly identifying, explaining, and fixing their classification errors. The LEMNA technique, devised at the Pennsylvania State University (Penn State) College of Information Sciences and Technology (with participation from researchers from the Chinese Academy of Science and the Virginia Institute of Technology), was tested through binary code reverse-engineering, which enables the reconstruction of software if the original source code is unavailable, before being applied to PDF malware classification. Most research to explain deep learning model classification errors concentrate on image, vision, or text applications, while LEMNA considers classification errors from models for security applications. Said Penn State's Wenbo Guo, "Using LEMNA we can build trust in the deep learning model, and if we can explain why the error occurred, we can probably patch the error." In the lead-up to the 2016 presidential election, digital fingerprints tracing back to Russian hackers were found looking for vulnerabilities on systems maintained by Election Systems & Software (ES&S), the company that manages Nebraska's Statewide Voter Registration System. In the wake of this attempt, Nebraska and ES&S joined the Election Infrastructure Information Sharing & Analysis Center, a consortium of states, election vendors, and federal agencies to provide real-time reporting on cyberthreats and attacks against critical infrastructure programs. In addition, ES&S became the first private entity to install an "Albert" sensor, which analyzes traffic coming into and out of Nebraska's voter database 24 hours a day. Before the 2016 election, only 14 states were using Albert monitors to safeguard their election systems; today, 36 states are using the system to scan for digital signatures of bad actors, according to the Elections Assistance Commission. The U.S. Food and Drug Administration (FDA) has published open source code and technical documentation on GitHub for an app that facilitates the collection of patient-provided data. The FDA said the MyStudies app is designed "to facilitate the input of real-world data directly by patients, which can be linked to electronic health data supporting traditional clinical trials, pragmatic trials, observational studies, and registries." The app can be reconfigured for varying health outcomes and therapeutic areas, and its partitioned data storage environment complies with the Federal Information Security Management Act and 21 CFR 11 for use in investigational drug oversight. The FDA said additional open source code will be released "over the next several calendar quarters" to enhance the app by simplifying researchers' ability to configure it, while improving the experience for participants. At Harvard University's T.H. Chan School of Public Health, researchers tested a Google-developed machine learning model that is significantly more accurate in identifying potentially unsafe restaurants than consumer complaints and routine inspections. The researchers said the FINDER system can identify problems in restaurants faster than other processes by first classifying search queries that can indicate food-borne illness, then using de-identified and aggregated location history data from the smartphones of people searching those terms and of places they had recently visited. In tests, the odds ratio that a restaurant identified by FINDER was unsafe was 1.68 times higher than complaint inspections. Said Google's Evgeniy Gabrilovich, "Today, we can use online data to make epidemiological observations in near-real time, with the potential for significantly improving public health in a timely and cost-efficient manner." Researchers at Finland's Tampere University of Technology and Cuba's Technical University of Havana have discovered a new vulnerability in Intel processors that can allow attackers to leak encrypted data from the internal process of a central processing unit (CPU). The researchers classified the PortSmash vulnerability as a side-channel attack that leaks encrypted data from the CPU. The attack works by recording and analyzing discrepancies in operation times, power consumption, electromagnetic leaks, or even sound to gain additional information that may be used to break encryption algorithms and recover the CPU's processed data. PortSmash impacts all CPUs that use a Simultaneous Multithreading architecture, which allows multiple computing threads to be executed at the same time on a single CPU core. Said Tampere University's Billy Brumley, "We detect port contention to construct a timing side-channel to exfiltrate information from processes running in parallel on the same physical core." University of California, Santa Barbara researchers have developed a technique to see through walls using ambient Wi-Fi signals and an ordinary smartphone. The team said the new method allows for an unprecedented invasion of privacy, as bad actors using smartphones can localize and track individuals in their homes or offices from outside by leveraging reflections of ambient Wi-Fi transmissions. The system looks for changes in an ordinary Wi-Fi signal that reveal the presence of humans, which can be detected by walking near a room or building several times. The researchers said that "with more than 2 Wi-Fi devices in a regular room, our attack can detect more than 99% of the user presence and movement in each room we have tested." Chinese authorities have started deploying "gait recognition" software that uses people's bodily configurations and manner of walk as identification for surveillance purposes. Watrix CEO Huang Yongzhen said his firm's system recognizes people from up to 50 meters away, even with their back turned or their face concealed. Watrix's software derives a person's silhouette from video and analyzes its movement to produce a model of the person's gait. Real-time identification is currently beyond its capabilities, as users must upload video into the software; searching 60 minutes of video takes about 10 minutes, using footage extracted from surveillance cameras. Huang said in addition to surveillance, gait recognition can be useful in spotting people in distress, such as seniors who have suffered a fall. Michael Cao, a high school student in Minnesota, has developed a virtual reality (VR) app that prepares children for an magnetic resonance imaging (MRI) scan. The app is a 90-second computer program stored in VR goggles. As it begins, the user sees a cartoon image of a little boy sitting on the edge of a hospital examination table, and then a kind woman's voice starts explaining the procedure. The user next becomes the boy and lies back on the table, which begins to slide into the virtual MRI machine. If the user successfully undergoes the exam without moving too much, the program ends with confetti and cheering. Said Chantel Barney of Gillette Children’s Specialty Healthcare in St. Paul, MN, clinicians could use feedback from the app to see if a specific child will be able to lie still for the procedure, or if they will need to be sedated. 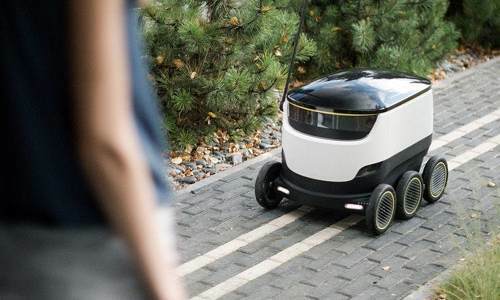 Estonia-based Starship Technologies plans to expand its home delivery service via autonomous wheeled robots, which customers can control with the company's app. After setting up a unique address within a Starship facility, customers can have packages from online orders delivered there; when a package arrives, the customer is sent a text notification to schedule a home delivery via robot. The company says its robots have covered more than 125,000 miles in more than 100 cities in 20 countries, delivering meals from local restaurants. The service is being rolled out in Milton Keynes, U.K., and plans call for an expansion into the San Francisco Bay area in the coming months. 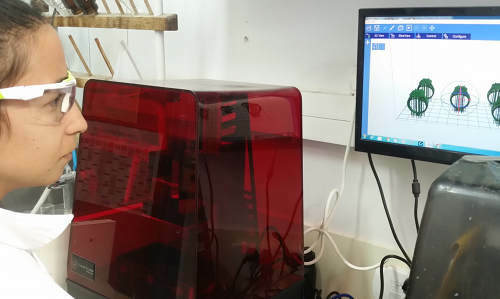 Researchers at Hebrew University in Israel have introduced a proof-of-concept prototype for three-dimensional (3D) printing of drug capsules, enabling customization of medications that conventional manufacturing cannot deliver. The drugs are printed from hydrogel objects, generating expandable and reconfigurable structures that activate on a delayed schedule. Hebrew University's Yaron Daniely said, "This technology is bringing us closer to a future in which the medical field can offer personalized, patient-centered care." By refining the geometry, surface area, and expansion index of tablets via 3D printing, the technology facilitates enhanced targeting of the site of drug dispatch in the digestive tract, as well as greater control of drug-release timing and duration. Said Hebrew University's Ofra Benny, "We can now think about combining drugs together into one drug instead of 10, to adjust the kinetics of drugs, and improve patient compliance in drug administration."